Click here to read our full band member bio's! Raindriver is a Rock band. We can fill a night with most/all Cover songs or Original music. 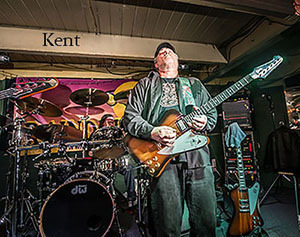 We are not your average Classic Rock/BluesRock Band, but we make a solid connection with those audiences. Raindriver performs the songs of Joe Bonamassa, Robben Ford, ZZ Top, The Who, Stevie Ray Vaughan, The Stones and more... and of course Raindriver! Raindriver is breaking that “same old” Classic Rock Mold... Come listen to your favorites, new & old, with a few surprises in between. You won’t be disappointed. Raindriver Rocks – real music, real passion... just the way BluesRock was meant to be served. Hot, Blue & Righteous! Smiling or sad, Raindriver is with you. Emoting fun & pleasure, consoling through pain & sorrow... Life. Take a look, have a listen... enjoy! Raindriver is preparing to go into the studio to record the follow-up to our debut release "Raindriver". Look for it in early 2019! If you're inclined please 'Like' us on Facebook, share and sponsor Raindriver by introducing us to your friends! The first thought a person might have upon stumbling into Raindriver: These guys rock. The second thought: Wouldn't you, if you could do that at their age? Raindriver is the ultimate garage band — "ultimate" because they do, in fact, practice in a Tigard garage. The quartet consists of Lead Singer Kent Wall of Tigard, Drummer William Anderson of Portland, and Bass Guitarist David Boyle, who works in Tigard, and Matt Bell, a Sherwood resident who teaches at Pacific University. They range in age from their 45 to 61. But a garage is just a jumping-off point. To find Raindriver, look toward clubs, such as Beaverton's Dublin Pub. And eventually, larger-stage arenas. "Right now, we're a little constrained," said Anderson, whose percussion suite looks a little too robust for most bars. "I think we belong on a concert stage. Really making a statement." Sitting around Wall's living room in Tigard, the others laugh. "Oh yeah," Wall said. "We're looking at 2017 to be a launch year for us." 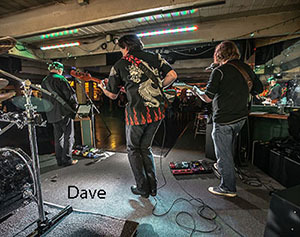 The band's been together a little over a year and a half and they consist mainly with rock 'n' roll covers, plus about a third of their own music. The sound ranges from Classical Rock to Blues-Rock. "This is 'Dreams,'" Wall says, toeing a stompbox and adjusting his electrical guitar. "It's an Allman Brothers song. Well, Allman Brothers by way of Buddy Miles." Which is code-talk for: The Raindriver version rocks. Their playlist leans toward The Who, Eric Clapton, Stevie Ray Vaughan and Lenny Kravitz, plus several of their own creations. The name of the band doesn't come from Portland's notoriously bad inclement-weather motorists. Wall heard another band called Raindriver in Florida in the 1970s. He'd picked up his first electric guitar by that point, around the time that the original Raindriver was making the Florida musical scene. "They absolutely blew me away. It was the first time I'd seen a real, live band knocking out real music. And I thought, 'Yeah. That's what I wanna do.'" He moved back to Oregon eventually and — since the original Raindriver had disbanded decades since — picked up the name. Wall is the service manager for a tool manufacturer. Anderson is an IT network engineer. Boyle sells stereos at Tigard Fred Meyer. And Bell teaches audiology, the branch of science focused on the sense of hearing. "Sort of ironic," Bell says with a shy smile. "I help people to hear sound again. And I create sound for people to listen to." Despite those varied backgrounds, when the four friends come together in Wall's garage, they sound smooth — like this is what they're supposed to be doing, regardless of day jobs. The garage itself feels like an extension of their personalities: a quadraphonic man cave, with space heaters, clamp-lamps, tons of garden implements, a spaghetti of cords for tuners, compressors and wah-wah pedals, plus sufficient room for the guitarists to roam and stage-kick. Anderson's drum kit takes up a space that the home's architect probably intended for an SUV. "This is what we do because, well, I guess we can't not do it," Boyle said. "Playing music has been my salvation through a lot of hard times," Anderson said. And he's done it all. Drummer for a country band. Drummer for a disco band. Drummer who can swing. He admitted, "Growing up, I played clarinet. I played violin." Bell faux-coughs into his hand: "Nerd." Wall said the group came together because of the alchemy they produce. "When I met these guys, I thought: David is wild. (William) is smart. And Matt? He's just good. Period. I tell you, this is the most unselfish band I've ever been with." Boyle agrees. "If it looks like we're having fun ... we are." And you can hear it in their music. "When you're putting a band together, you just don't know," Wall said. "The type of music? That's about 20 percent of the equation. The logistics of everyone's schedule? That's maybe 15 percent. After that, the rest of it just comes down to the guys. That's the big thing. That's the alchemy." © Copyright 2018, Raindriver™. All Rights Reserved.